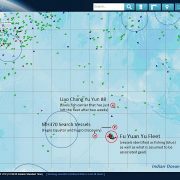 I would like to provide an update on our post from earlier this month on the Fu Yuan Yu Fleet appearing near the search site for Malaysian Airlines Flight 370. We were puzzled to see a large number of fishing vessels at this remote location. Since our post we have received information indicating that these vessels are licensed Chinese fishing vessels targeting small pelagic species. 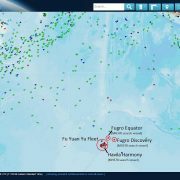 The Fu Yuan Yu fleet now appears just south of the area being surveyed by MH370 search vessels Fugro Equator and Fugro Discovery. The Liao Chang Yu Yun 88 can be seen headed north after spending two weeks with the fleet. This Chinese flagged vessel is likely a fish carrier. If as reported the Fu Yuan Yu vessels 070, 071, 072, 073, 075, 076 are targeting small pelagic species (not tuna) then they would not need to be licensed by an RFMO (Regional Fishery Management Organization) in the Indian Ocean. However we are still curious about the fishing methods of this fleet, described as lightning purse seiners. The lightning presumably refers to use of light attraction in their fishing operation. Each parent vessel appears to be associated with a string of 5 or 6 AIS beacons attached to some type of gear. The vessel and gear can be drifting and strung out in a 30 mile string as seen in the recent screenshots below. Or at other times each parent vessel and set of associated gear is in the same location. This pattern made us think of setting and retrieving a longline but these vessels have now been reported as purse seiners so the fishing operation is puzzling. Below you will see track for one of the fishing vessels, Fu Yuan Yu 070, as well as what we assume is a piece of associated fishing gear (070 04). The two tracks can be seen to overlay closely. We are looking for further information to clarify the fishing operation taking place. The track of the Fu Yuan Yu 070 (black dashed line) over three days. Other vessels of the Fu Yuan Yu Fleet also appear to the south each with string of what is assumed to be associated fishing gear extending southeast about 30 km. All vessels have been described as lighting purse seiners. Here is shown the three day track of one of presumed pieces of fishing gear associated with the Fu Yuan Yu 070. 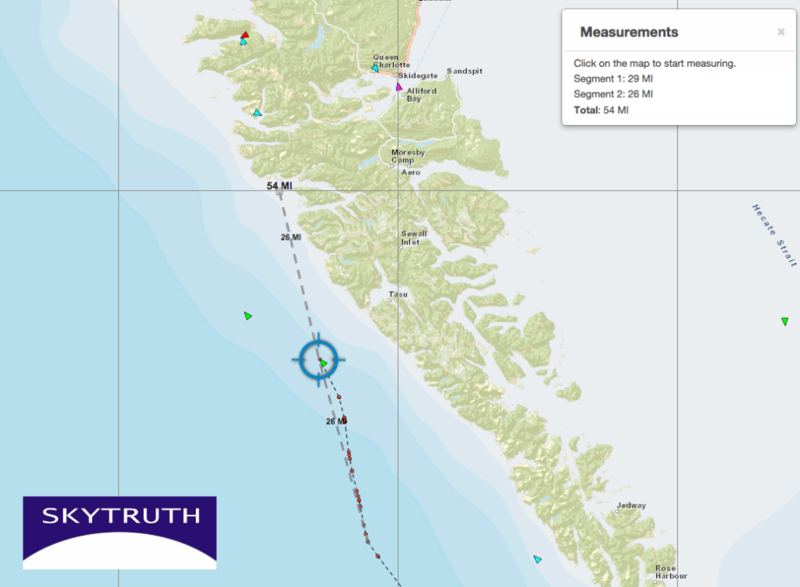 The track has fewer broadcast AIS positions but it can be seen to closely follow that of the parent vessel. Over the past month we’ve been watching an unusual Chinese fleet in a remote area of the Southern Indian Ocean. These vessels identify themselves as fishing but were not found in any public fishing registry and appear almost 500 miles distant from the nearest known fishing vessels. 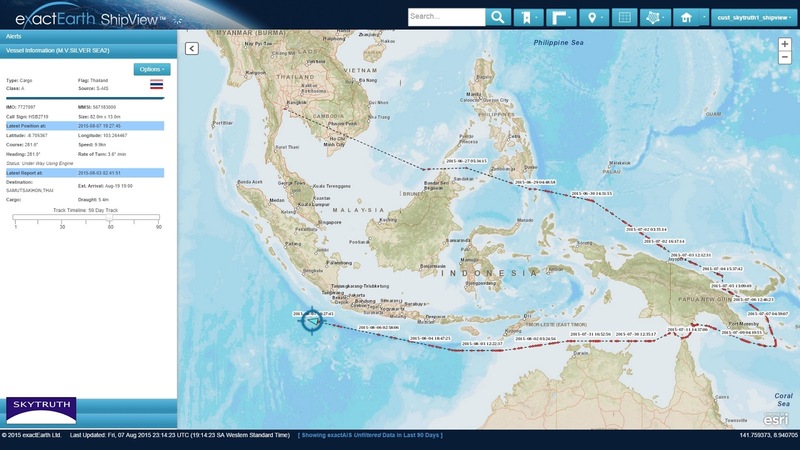 This self-identified fishing fleet is currently operating in very close proximity to vessels searching for Malaysian Airlines Flight 370 (MH370). This fleet, with vessels broadcasting the name Fu Yuan Yu, has been in the general search area over the past month but today appears within several miles of the MH370 search vessel Havila Harmony. 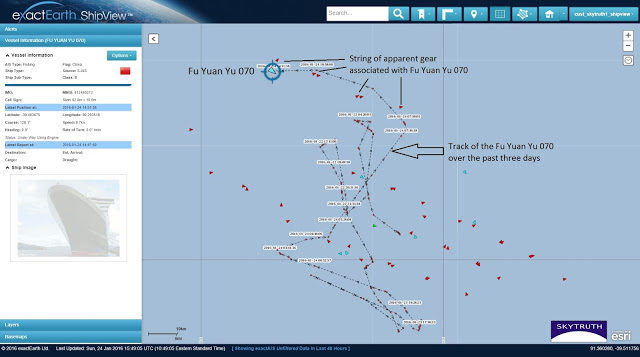 We’ve shared vessel tracks of the Fu Yuan Yu fleet with members of several regional fisheries management organizations but so far no one has been able to confirm the activity of the fleet though all agree that the location is unusual for fishing vessels. We’d be very interested to hear from anyone who can confirm the identity of these vessels (Fu Yuan Yu 70, 71, 72, 73, 75, 76) and explain their activity in this unusual location. 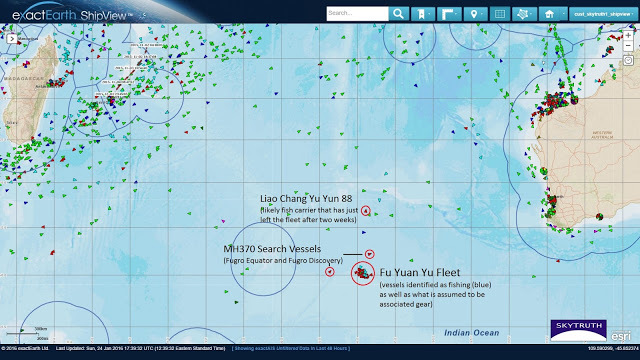 The three MH370 search vessels (small circles) are shown near to the Chinese Fu Yuan Yu Fleet. Vessels of the Fu Yuan Yu fleet identify themselves as fishing but this remote location is not a known fishing area. The nearest confirmed fishing vessels (light blue) are about 500 miles to the the north and to the west. The MH370 search vessel Havila Harmony, flagged to Malaysia, currently appears surrounded by a Chinese fleet whose activity in the area is unclear. Fu Yuan Yu vessels identify themselves as fishing though this could not be confirmed by registry or port records. Each vessel appear to be trailed by a string of five or six points (red triangles), probably some sort of gear associated with the parent vessel. Fu Yuan Yu vessels appear to make up a major global fishing fleet with over 120 vessels broadcasting with that name. Three Fu Yuan Yu vessels (numbers 013, 997,998) are currently authorized by the IOTC (Indian Ocean Tuna Commission) to target tuna in the Indian Ocean. Since the Fu Yuan Yu vessels we are observing here are not registered with the IOTC they could not target tuna but it’s not clear that there is another likely target species. Normally vessel registry records, like those issued by the IOTC and other regional fisheries management organizations, would allow us to confirm a fishing vessel’s identity and get details on the vessel’s operation, such as the fishing gear they employ. However no such information has been found for the Fu Yuan Yu vessels appearing in the MH370 search area. 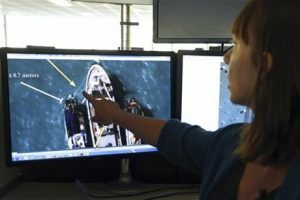 Thanks to daring investigative journalism supported by data-driven intelligence from SkyTruth, the lawlessness of the high seas has recently been making major headlines. In March, the AP published the results of a year-long investigation that revealed slave-caught seafood in the supply chains of major American supermarkets. Their stories traced the repatriation of one Myanmar fisherman after 22 years separated from his family, and prompted the rescue of hundreds of migrant fishermen from captivity on remote Indonesian islands. Last month, in a tour-de-force of international journalism, the New York Times exposed the contemptible track record of the Dona Liberta, a name-changing, flag-switching cargo ship that we observed spilling oil off the coast of Angola back in 2012. The Times investigation also explored slavery, murder, and poaching on the high seas in their four-part series The Outlaw Ocean.In April, SkyTruth began monitoring more than half a dozen vessels suspected to be involved in the trafficking and enslavement of Burmese migrants on fishing boats working the sea off Southeast Asia. Through careful analysis of satellite-derived vessel location data over a six-month period, we were able to help the AP acquire the satellite image above, capturing an apparent transshipment at sea, where fish are transferred from one vessel to another. Many of the fishing vessels we are interested in are exempt from broadcasting their location via the Automatic Identification System (AIS), but because they stay at sea for months at a time, must regularly offload their catch to refrigerated cargo ships (also known as “reefers”) like the Silver Sea 2. For safety reasons, large ships including reefers are required by international law to broadcast their identity, location and speed via AIS, giving us a way to catch a glimpse of the shadowy world of transshipments at sea. 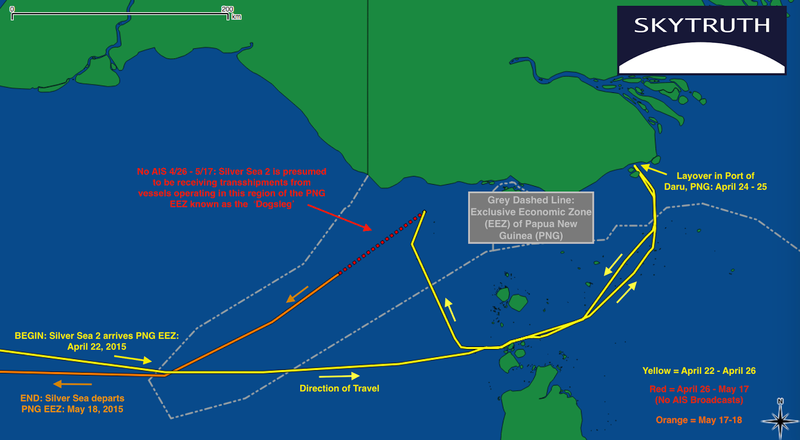 April 2015 – Silver Sea 2 completes a circuit through the ‘Dog Leg’ region of the Papua New Guinea EEZ. Three months later, DigitalGlobe would capture an image of the Silver Sea 2 in almost exactly the same location, receiving catch from suspect fishing vessels. 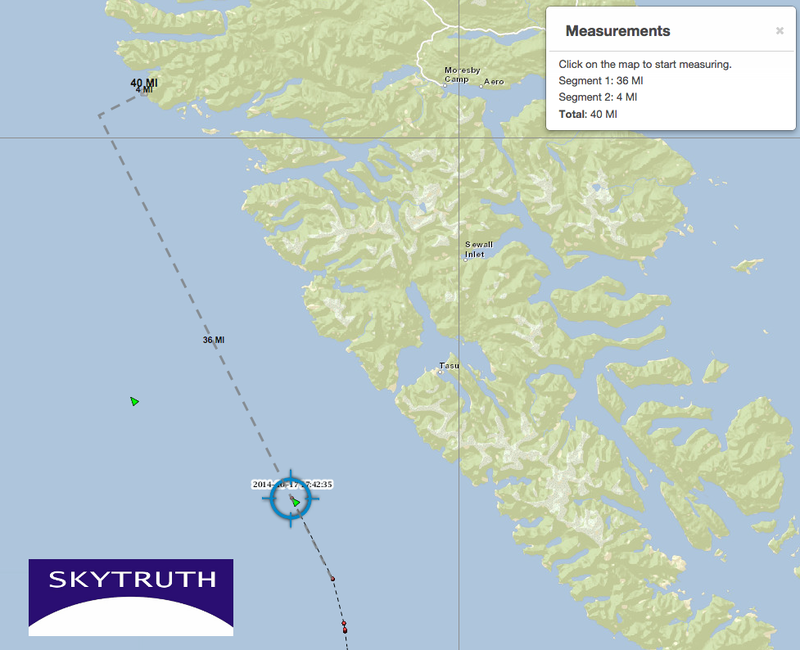 Credit: AIS data from exactEarth and ORBCOMM; map by SkyTruth. For three weeks the Silver Sea 2 lingered in a region of Papua New Guinea’s Exclusive Economic Zone (EEZ) called the Dog Leg. During this time, the reefer stopped broadcasting its location and was presumably receiving shipments of seafood from trawlers operating in the area. On May 17, the Silver Sea 2 turned its AIS transponder back on and headed west, destined for Indonesia and Thailand. Looking back in time, we found evidence of two other Silver Sea reefers making this same circuit. Armed with intelligence that revealed a predictable pattern, our team was optimistic that we might be able to get a satellite snapshot of the “Dark Fleet” that was offloading fish to the Silver Sea reefers. Intentionally collecting a high-resolution satellite image of a fishing boat underway at sea is difficult. Transshipments, however, are another story: reefers are stationary, or moving very slowly and predictably, for hours to days at a time while they receive catch from vessels in the area. There is still a possibility that clouds could obscure the target, or no fishing vessels are alongside at the moment the satellite flies overhead, but the odds of success are better. On July 13th we notified AP that Silver Sea 2 was returning, following the same pattern we observed in April. Another Thai reefer, the Sea Network, was also anchored in this coastal transshipment area. With two reefers likely transshiping catch, the time was ripe to go for it. Later that day, the WorldView-3 satellite collected an image of Silver Sea 2 rendezvousing with two vessels believed to be part of the slave fleet previously operating out of Benjina. 60-day track of the Silver Sea 2, as of August 7, 2015. Image Credit: ShipView from exactEarth. Includes material © 2015 exactEarth Ltd. All Rights Reserved. 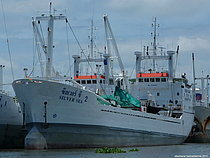 The Silver Sea 2 is now well under way toward Thailand, but news of this transshipment being spotted by satellite appears to have prompted authorities step up their efforts. Another Thai cargo ship, Blissful Reefer, has been detained and eight more fishermen have been freed from purported slavery at sea. THIS PAGE HAS BEEN UPDATED FROM THE ORIGINAL posted in November 2014. On September 15, 2016, at the Our Ocean Conference in Washington, DC. Actor and ocean advocate Leonardo DiCaprio announced in his remarks to the conference that Global Fishing Watch is now free and open to the public, and U.S. Secretary of State John Kerry personally received a demonstration of the tool from the Oceana, SkyTruth, and Google team. Visit Globalfishingwatch.org to see what we’re so excited about. Find the FAQ page here. Sign up for updates + Let us know how you might use Global Fishing Watch! UPDATED OCT. 18, 2014 at 9:42 AM: Canadian Coast Guard patrol vessel Gordon Reid has gained control of the “Симушр” and is towing it out to sea. 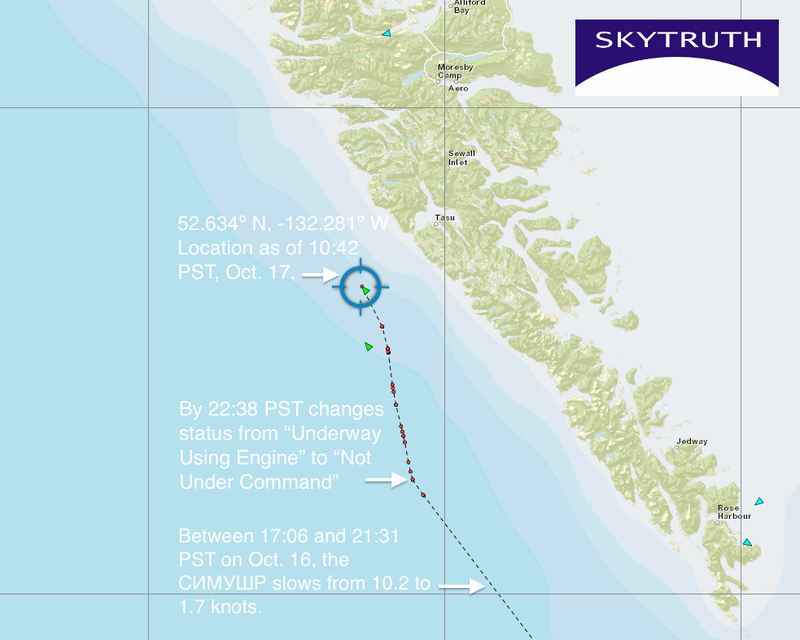 As of 6:00 am, the Reid had put 14 miles between the stricken tanker and the coast of Haida Gwaii. USCG Spar is arriving on the scene, but the American tugboat Barbara Foss was still over 200 miles out. Image includes material © 2014 exactEarth Ltd. All Rights Reserved. 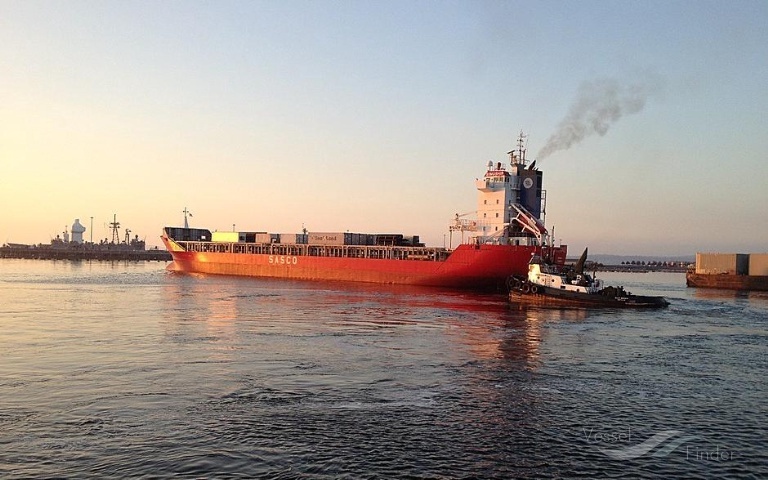 ORIGINAL POST: Canadian media and the Council of the Haida Nation are reporting that a 443 foot Russian cargo vessel lost power early this morning in gale-force winds, and is now slowly drifting towards the Canadian coastline. The Симушр (pronounced “Simushir”) is a cargo vessel, but is also laden with over 110,000 gallons of “bunker fuel” (a heavy fuel oil) and 13,000 gallons of diesel fuel (500 and 60 metric tonnes, respectively). The vessel СИМУШР(SIMUSHIR), courtesy of VesselFinder.com. According to satellite AIS data, the vessel is 10 miles SE of the coast, and slowly drifting almost due north at an average speed of 2.87 knots (3.3 mph) over the last 9 hours. Weather reports referenced by the Haida Nation stated, “Thirty-five to forty-five [MPH?] south-east winds are blowing the vessel to shore in a 7-10 metre sea.” However the release also stated that the winds are expected to turn westerly in the afternoon. Timeline of the СИМУШР’s drift since Oct. 16, 2014 based on satellite AIS data. The vessel is currently 10 miles from the nearest point of land. Image includes material © 2014 exactEarth Ltd. All Rights Reserved. A weather buoy off the coast of Haida Gwaii is reporting that the wave height is down to 4.5 meters, but the winds are still coming from the southwest at 16-19 knots (~18-22 MPH). We cannot say with any certainty how the currents or winds will effect the vessel as it gets closer to shore, but a few straight-line calculations may put the risk in perspective. If we plot a straight line from where the Симушр reported it was no longer under command, through the vessel’s last reported location, all the way to landfall with the coast; we find it has drifted approximately 29 miles in just under 9 hours. 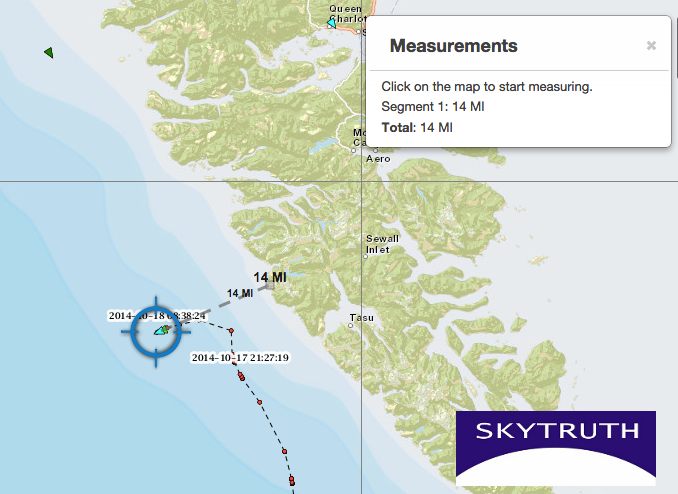 On this trajectory, it could reach the northern part of Haida Gwaii in 26 miles during the early hours of October 18th. This trajectory clears the coastline by 4 miles, again in the early hours of tomorrow morning. However, ocean currents and winds do not follow straight lines, so reality will almost certainly be somewhat different than these projections. Thankfully, nearby vessels like the North Star, an 839 foot American container ship, are closing in on the stricken ship to assist it. Additionally, the Gordon Reid, a Coast Guard Patrol Vessel, is only 21 miles away and closing fast. The Reid was originally reported to be 750 km (466 mi) away. This post will be updated as details unfold.